Luke Anderson is the executive director and co-founder of the StopGap Foundation, which helps communities discover the benefits of barrier-free spaces. He says barrier-free spaces help everyone — not just people with disabilities. Luke Anderson has thought a lot about designing accessible spaces. And he's come to an important conclusion. "It's not us that have disabilities, but it's the places we live, work and play that are disabled," Anderson told Tapestry guest host Christa Couture. In his early twenties, Anderson injured his spine in a mountain biking accident. Suddenly, he faced new barriers between him and his favourite places. "My favourite ice cream shop has a step. I'm fully able to buy an ice cream, but I can't because of that step," said Anderson. 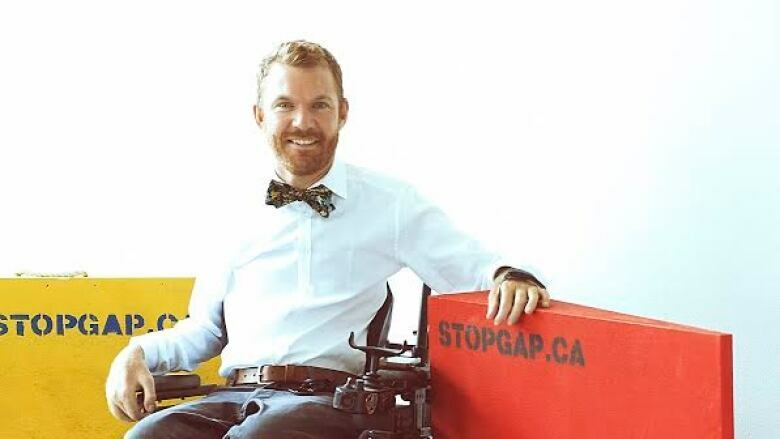 Experiences like this led Anderson to create StopGap — a project that aims to eliminate access limitations for people with disabilities by installing removable, brightly coloured ramps at businesses with steps. For Anderson, good design is accessible design. He points to several designs originally created to help people with disabilities that benefit everyone — not just people with disabilities. "I always point out curb cuts at intersections," said Anderson. Curb cuts are the small dips at intersections that allow for a smooth transition between the sidewalk and the road. "For someone in my situation who uses a wheelchair, or a delivery person, or a parent pushing a stroller, they'd be really challenged to get around many cities without those curb cuts," said Anderson. Anderson believes demand for accessible design will increase because, in his view, all people are "T.A.B.s." T.A.B. is an acronym that stands for "Temporarily Able-Bodied." "Inevitably we will encounter a change in our ability to move around, whether we become a parent, sprain our ankle, or just age," said Anderson. "So it's in our best interests to make sure that our communities are set up to help someone move around independently." For Anderson, accessible design is ultimately about empowering individuals but he says we can also empower people with language. Anderson uses person-first language, which emphasizes the person before their disability. "I'm not a wheelchair person, I'm a guy who uses a wheelchair," said Anderson. Anderson also wants to empower people with disabilities by changing access signage. "We're all familiar with that existing wheelchair access logo … but I've got some issues with that symbol," said Anderson. "I feel like my eye is drawn to a chair and not the person using the chair… but there's a new proposed symbol out there — a dynamic symbol — that when I look at it, my eye is drawn to the person and not so much the chair." While person-first language is the preferred style for most publications, there is debate about it within disability communities. For instance, Tapestry guest host, Christa Couture prefers identity-first language, which places a person's disability front and centre. "For me it feels so integrated into who I am. I'm Indigenous, I'm queer, I'm a quarter Norwegian and I'm disabled, and that's not a negative thing," said Couture. While she and Anderson differ in how they identify, both agree asking for and respecting people's preference is the most important thing. "Just asking and listening is really key," said Anderson. "As long as we're moving away from language like handicapped or cripple — 'handicapped parking' becomes 'accessible parking'. That just feels better, there's a totally different tone there. And then we can start to play within our own desires of how we would like to be referred to." Click LISTEN to hear Luke Anderson tell Christa about another example of accessible design that benefits everyone — and specifically, our teeth.